When comparing per gallon taxes on alcohol, spirits taxes are by far the highest (followed by wine and beer). Spirits are taxed the highest in Washington at $35.22 per gallon. Next in line are Oregon ($22.73), Virginia ($19.19), Alabama ($18.23), and Alaska ($12.80). 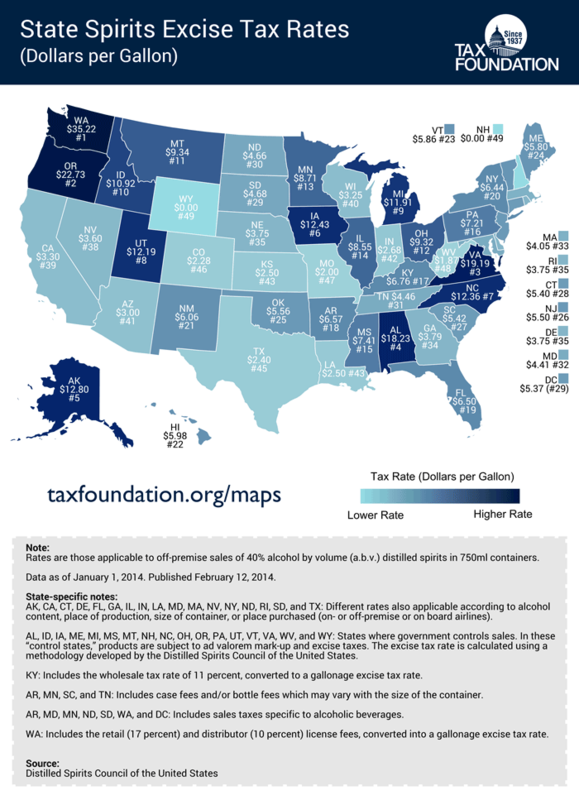 Least-taxed states are Wyoming and New Hampshire, which have no spirits excise taxes (note that these are states in which the government controls all sales, and spirits may be subject to ad valorem mark-up and excise taxes). These are followed by West Virginia ($1.87), Missouri ($2.00), Colorado ($2.28), and Texas ($2.40). To see where your state falls, see the map below. There isn’t much consistency on how state and local governments tax spirits. This rate can include fixed-rate per volume taxes; wholesale taxes that are usually a percentage of the value of the product; distributor taxes (usually structured as license fees but are usually a percentage of revenues); retail taxes, in which retailers owe an extra percentage of revenues; case or bottle fees (which can vary based on size of container); and additional sales taxes (note that this measure does not include general sales tax, only those in excess of the general rate). For more info on alcohol taxes, see here. To see how distilled spirits taxation works in each state, check out this handy table from the Federation of Tax Administrators. Follow Liz and Lyman on Twitter @elizabeth_malm and @notedlemons, respectively.